It’s springtime so I am thinking of lighter food, and of course salads come to my mind. I make this recipe with couscous or quinoa. I have another recipe for quinoa on my website so I figured that I would make one with couscous this time, but feel free to use either one. The dressing has a definite Greek flavor. This dish is perfectly tasty and served with grilled fish or chicken you have a perfect meal. As far as salads go, this one is perfection. This is not an exact science; if you like a lot of tomatoes, add more. If there is another item here that you don’t like, feel free to substitute, and I’d love to hear what you did. I love to hear variations on my recipes. This is so quick and easy to assemble. Can definitely be made ahead of time. Kosher salt and freshly ground black pepper to taste – I started with a 1/4 teaspoon of Kosher Salt and a few grinds of the peppermill. In a medium bowl, combine all ingredients and whisk in the olive oil slowly. Adjust the salt and pepper and set aside. Prepare 1 box (usually 10 – 12 ounces) couscous (or quinoa) according to the directions but use 1/4 less water than it calls for. For example, the Near East Couscous calls for 2 cups of water or broth so I would reduce by 1/2 cup. After cooking, allow to cool for a bit then stick in the fridge for about an hour. 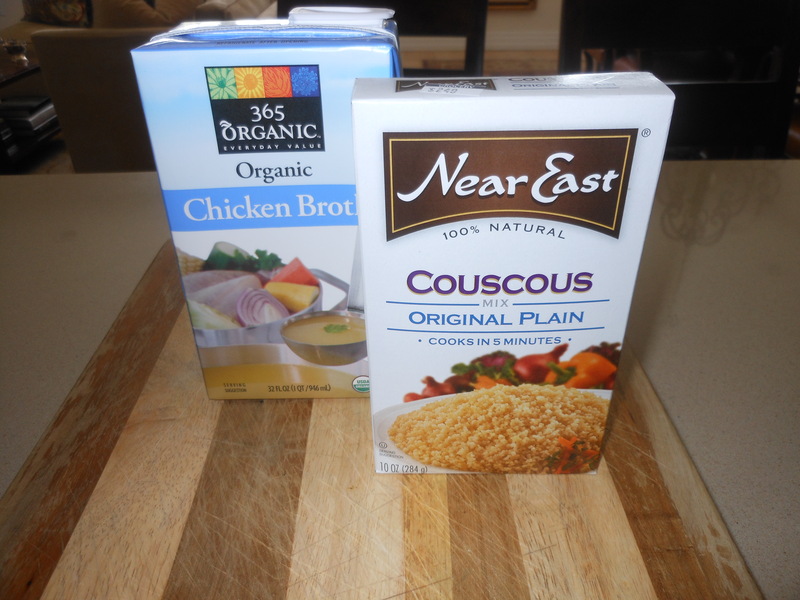 I usually cook my couscous in either chicken broth or vegetable broth for extra added flavor. 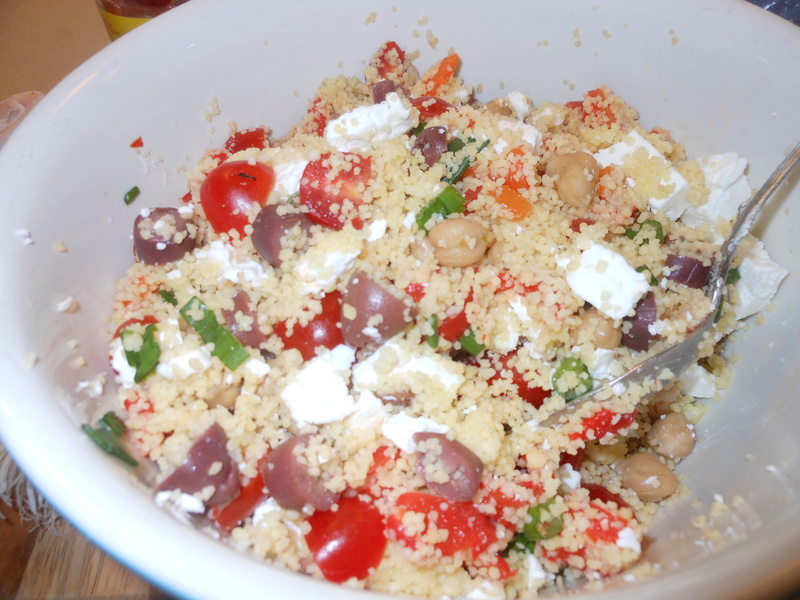 In a large bowl, gently toss the couscous, tomato, pepper, olives, beans and feta. Add the dressing, transfer to a lovely serving bowl and there you go. This is so delicious and light, it’s a perfect side dish and a beautiful salad . 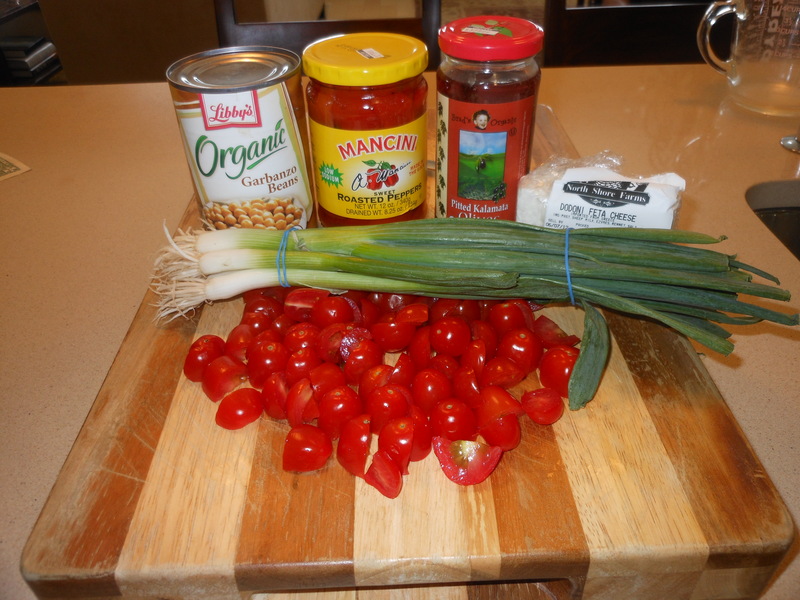 This entry was posted in Healthy Cooking with Candi, Raw, Salad, salad dressing, vegetables, vegetarian and tagged Greek Style Couscous or Quinoa, Mediterranean Style Salad Dressing with Couscous or Quinoa. Bookmark the permalink. Near East makes a mediterranean version that i love, but this one sounds even better!